That’s where Chazz comes in. He happens to be a sound-effects whiz for Booktrack.com. They pioneered the idea of adding music and sound effects to ebooks. Right now, Booktrack is doing this cool thing where you can refer a friend and get free booktracks. If you’re like me, FREE is your favorite price. 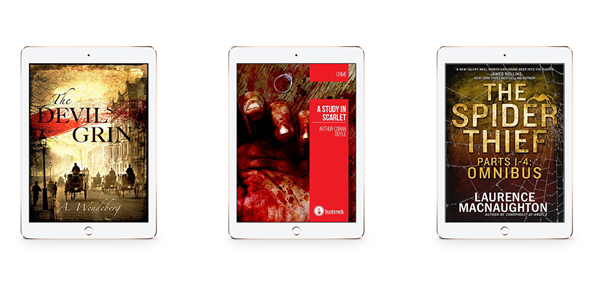 You’ll get The Devil’s Grin by Annelie Wendeberg, Sherlock Holmes: A Study in Scarlet by Sir Arthur Conan Doyle, and The Spider Thief by yours truly. By the way, this is a brand-new edition of The Spider Thief, with all-new music and sound effect: bullets flying, tires screeching, glass breaking. Definitely break out the good earphones for this one. But hurry — I don’t know how long this deal will last! Click here. P.S. Take a minute and check out Chazz’s band, Flirting With Disaster. Want even more free stuff? Don’t miss a giveaway. Join my author newsletter now.